This is a great offer that men who love quality sterling silver should just not miss. The silver ring will also make a great gift and you could gift it for just about any occasion. You get the same quality workmanship and handpicked gems that have made, Kaisilver the most respected source for quality men's jewelry. You can order this men's sterling silver ring with a range of gemstones and in sizes ranging from, 7 to 15 - we can also accommodate requests for half and quarter sizes. With a handsome silver weight of 15 to 22 grams, we leave the inside of the ring solid and without any scooping being done. This makes the ring extremely sturdy and also very comfortable to wear. 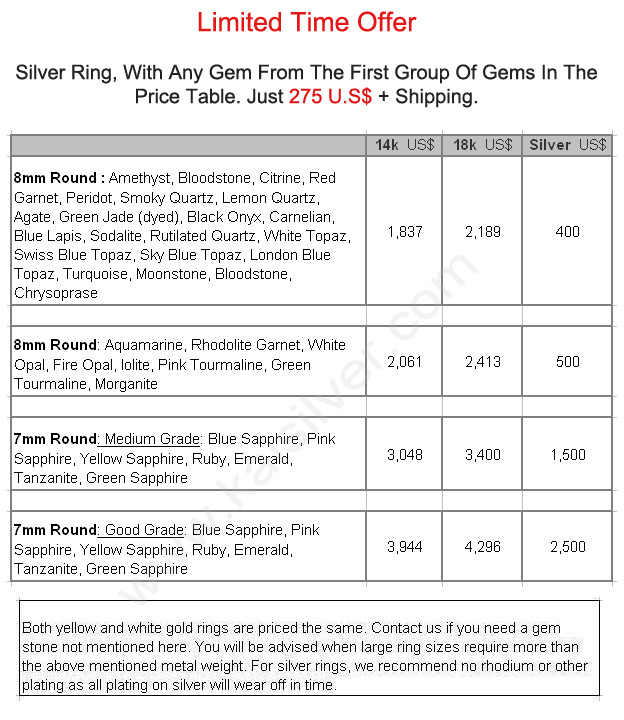 The offer is applicable only for the 925 silver ring option and with any of the gems, mentioned in the first category of gemstones. The ring will have an 8mm round gemstone and a front head height of around 11-12mm (1.1 to 1.2cm). You can request for the texture as shown in the image, or order the ring as a plain ring with no texture on the band. Plating: While we do provide options for white, yellow or rose gold plating on the MAN121 sterling silver ring, here is an important note. Any type of plating on sterling silver will wear off over a period of time. If you still prefer to have your men's silver ring plated, email us with the plating that you require. There is a plating fee of 15 U.S$ to be added to the quoted price, for any of the plating options mentioned above. In the long run, it is easier and more convenient to clean a silver ring that was never plated. Since the wear off on a plated silver ring does not happen uniformly, cleaning the jewel might pose some challenges. It is not easy to accurately estimate the duration for which any plating will last on the silver ring. The wear off depends on a number of factors and these could vary depending on location, humidity, composition of sweat and water too. We would therefore recommend that you leave the ring un-plated, but the final choice is yours. REGULAR PRICE: 400 U.S$ + Shipping, For A Limited Time: 275 U.S$ + Shipping. Highlights Of The Offer For MAN121. Sterling silver ring, weight around 15 to 22 grams. You can specify a smooth high polish finish or the texture as shown in the image. Any gem from the first category of gems shown in the price table. Gemstones are 8mm round and custom cut. Ring head height 11mm to 12mm and 5mm behind the finger. Sturdy and durable with no scooping inside the band. Solid inside, making the ring comfortable to wear and long lasting. Plating options available, read the paragraph related to plating. All ring sizes from 7 to 15, half and quarter ring sizes can also be accommodated. Etching of name or short message inside the band possible, at no extra charge. Will make a great gift for a dad, boyfriend, husband, son or friend. Kaisilver: We custom make all jewelry in gold or sterling silver with gems and design of your choice. With direct connections to gem mining sources across the globe and preferential access, to over 200 million carats of cut and polished gemstones, we place no restriction on your gem selection. Expert artisans craft every jewelry that we make, you can pick a design from our website and request for modifications or, email us design sketches of your own. Email our experts at sales@kaisilver.com with any queries or requirements that you might have. How To Buy: When it comes to buying fine jewelry that we craft, we do not encourage you to make a rush purchase, this explains the absence of screaming 'Buy Now', 'Check Out', 'Express Checkout' icons on our websites. We would suggest that you discuss your requirements with our experts and make sure that, all your queries and doubts are answered. We accept payment through Paypal and Western Union but, suggest that first time buyers use Paypal as it provides a safer platform for both, you and us. Let us know which mode of payment you prefer and we will provide details for the same. Production time is generally 4 to 6 weeks from the date of order confirmation and receipt of payment. Our support team will inform you about the production lead time before, your order is confirmed with payment. Shipping is through FEDEX with web tracking, there is an additional charge to be added to the above prices to cover the cost of shipping. Add 35 U.S$ for shipping to the U.S, Australia, New Zealand and Japan. The cost of FEDEX shipping to most parts of Europe is 45 U.S$. You will be informed of the exact shipping charges once we are informed about your location.